Perhaps one of most exciting emerging technologies is 3D printing. This new technology has the potential to change the world in a much more profound way than the rise of the Internet. 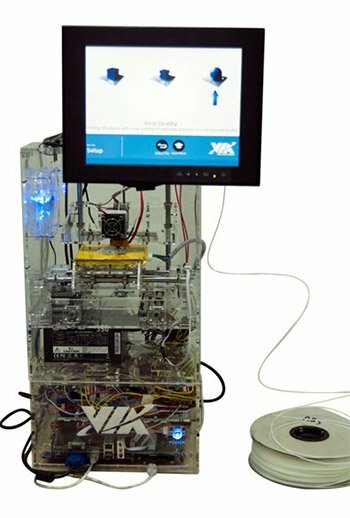 3D printing has been in use for decades for the purpose of rapid prototyping and in recent years it has seen rapid adoption among hobbyists and enthusiast who have used the technology to create toys and models, basic household objects and tools, replacement parts, and even a lower receiver of a gun. Perhaps this technology will be what it takes to kick off a new industrial resolution, it's not hard to see that being able to manufacture products at a much more local level (and even at home) is going to have a major impact on the manufacturing industry as we know it. While traditional manufacturing is subtractive manufacturing because it involves cutting down and shaving off materials, 3D printing uses additive manufacturing. 3D printing startups claim this new production process requires just one tenth of the raw material used in traditional manufacturing, while also using 50 percent less energy. By combining MakerBot's Thing-o-Matic 3D Printer with VIA's VE-900 system the company combined product design and manufacturing into a single device. If you're into creating new and innovative designs, be that product enclosures or protection for public utility, military, business or consumer - combining a MakerBot with VIA hardware significantly reduces time to market.